Animal organs. Digestive system. Tongue. Atlas of plant and animal histology. Technique: paraffin embedding, staining with A) van Gieson, B) haematoxylin-eosin. The tongue is mostly formed by skeletal striated muscle tissue with cells arranged in different directions, that allows very flexible and accurate movements, which are very important for tasks like talk in humans (or make sounds in some animals), chew and swallow down. The tongue is coated by stratified squamous epithelium, usually non keratinized, although some mammals can show a corneum stratum. 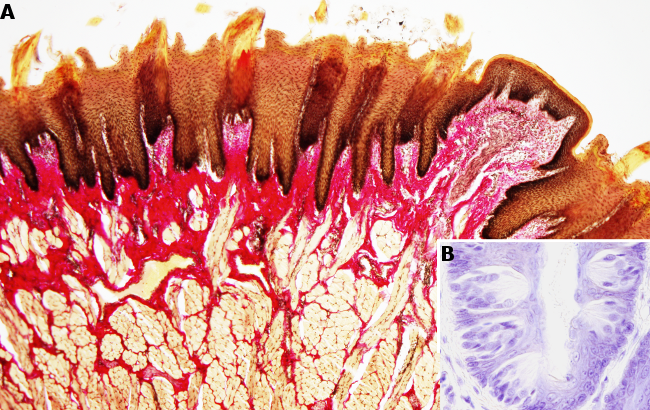 Under the epithelium and among muscle cells, there is connective tissue with many collagen fibers (stained red with van Gieson trichrome in the figure above). Besides fibroblasts, connective tissue also contains adipocytes. 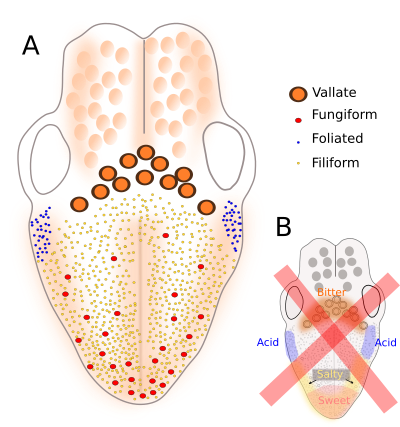 The dorsal surface of the tongue folds to form structures known as papillae with different morphologies: filiform, foliate, fungiform and circumvallate. They show a characteristic spatial distribution on the surface of the tongue. Types of papillae (from the left to the right): filiform papillae (rat, PAS-haematoxylin), foliate papilla (mouse, van Gieson trichrome), fungiform papillae with taste buds (arrows) surrounded by filiform papillae in transverse view (rat, haemotylin and van Gieson's trichrome). Filiform papillae are the smallest and more abundant papillae. They are covered by squamous keratinized epithelium and do not contain taste buds (the sensory structures for perceiving tasting). Thus, they perform just a mechanical role and provide the tongue with a rough surface to move the food and sense touch and pressure. 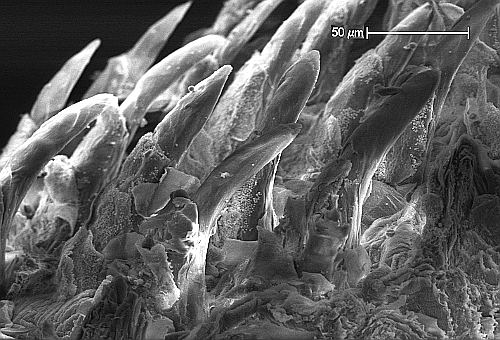 Scanning microscopy image showing filiform papillae of a rat tongue. Foliate papillae are short protrusions separated between each other by parallel grooves. They have taste buds located laterally. In humans, they are rudimentary and are found in the posterior-lateral part of the tongue. In other mammals, foliate papillae are well-developed. For example, rabbits show the highest density of taste buds in foliate papillae. Fungiform papillae are expansions of the tongue surface showing fungi-like shapes. They contain taste buds distributed in the distal (upper) part of the papilla. Circumvallate papillae, or vallate papillae, are the largest papilla, dome-shaped, and surrounded by an invaginated circular groove with a lot taste buds. Lingual serous glands release their content into these grooves. Circumvallate papillae are usually located in the posterior part of the tongue. Taste buds are the structures responsible for sensing tastes. They are made up of three types of cells: sensory cells, supporting cells and basal cells. Sensory cells, or taste receptor cells, have receptors in their apical membranes for detecting molecules with taste information. Basal cells renew the taste bud cell population, both sensory and supporting cells, by mitosis and differentiation. Contrary to what is believed, the five types of tastes can be discerned in all parts of the tongue, i.e, there are no parts of the tongue detecting a particular taste. Therefore, no papilla is related to a specific type of taste. It means that taste buds for particular flavor can be found in every type of papilla and in every part of the tongue surface. Drawing showing the distribution of the different types of papillae in the human tongue. The ability to perceive a particular taste is not, however, restricted to any region of the tongue. Therefore, the image B is incorrect.